A Dremel rotary tool is a must-have for every DIYer, hobbyists and even regular homeowners as it can come in handy for a variety of projects and tasks at home. Their versatility and ease of use of these tools are unmatched by what many other brands have to offer. But, like with any other rotary tool brand, you have to choose the right one for you from different models. And for many people, this means having to choose between Dremel 4000 and Dremel 4200. Both rotary tools maintain the versatility, high-performance, and convenience that Dremel rotary tools are famous for, but they differ in a few aspects. Below we compare different aspects of these two rotary tools and their various kit options to help make it easy for you to pick between them. Although Dremel 4200 is somewhat an improvement of Dremel 4000, from our comparison table above it is clear that there is not much difference between the two tools. Both run on 1.6-Amp motors and this means they produce the same amount of power and so their performance is also similar. The point of departure between these handy tools is the accessory change system and their kit options. Dremel 4000 uses the EZ Twist Nose Cap while the 4200 uses an EZ change system. When it comes to the kit options, Dremel 4000 provides one more attachment an accessories combination than the 4200. However, most Dremel 4200 kit options have more attachment and accessories than what you find on most kit options on the Dremel 4000 series. Besides the obvious physical differences in dimensions and weight between these two rotary tools, their most significant differences are the accessory change system and kit options. And here is what each has to offer. The accessory change or chuck system is the piece that tightens around and secures the shank on the accessory bits that rotary tools use to perform their tasks. Chuck systems are available in different types and sizes (for example, 1/16, 1/32 and 1/8 inches) both of which determine the types of accessories that the rotary tool can accept and also how easy they will be to change. Dremel rotary tools are designed to accept various accessories and attachments. But different models will use different chuck systems to allow for this. The Dremel 4000 uses Dremel’s EZ Nose Twist Cap to make accessory change fast and easy. This chuck system features an integrated wrench that will allow the nose cap to be used as a wrench for tightening or loosening the collet nut when changing the accessories. 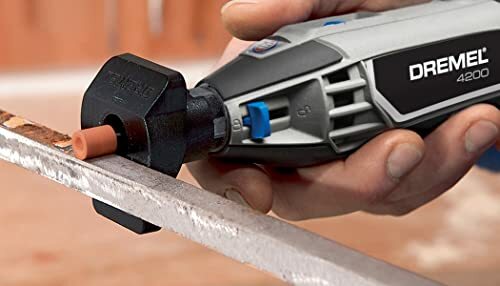 While both accessory change systems make accessories fast and easy to change, the EZ change system on Dremel 4200 is a much better option simply because you will not need a wrench. Most rotary tools from Dremel will come in different kit options which are typically indicated by two numbers after the model number. The numbers written after the model number (for example 2/30 in Dremel-2/30) will indicate the number of attachments and accessories on the kit. The first number, 2 in this instance will indicate the number of attachments on the kit, and the second number which is 30 in our example shows the number of accessories that you get. Dremel 4000 is available in four kit options which are 4000-2/30, 4000-3/34, 4000-4/34 and 4000-6/50 while Dremel 4200 is available in three kit options which are 4200-4/36, 4200-6/40 and 4200-8/64. The Dremel 4000-2/30 is the most basic rotary kit on the Dremel 4000 series as it contains only 2 attachments and 30 accessories which are both fewer than what you get on the other three kits. Despite not having as many accessories as the other three Dremel 4000 kits, this kit still has enough to make it useful for carving, engraving, cutting, grinding, sharpening, cleaning, polishing and sanding. And it also comes with both carry and accessory cases. Dremel 4000-3/34 has 1 attachment and 4 accessories more than what you get on the 4000-2/30 and hence making it a little more versatile. The attachments that you get on this kit are a multipurpose cutting guide, sanding/grinding guide, and the detailer's grip. Dremel 4000-3/34 can do everything that the 2/30 kit can do but it has more polishing accessories and fewer sanding accessories than the latter. And so it will be a much better option for those looking for a rotary tool kit specifically for cleaning and polishing. The Dremel 4000-4/34 has the same number of accessories as the 3/34 above bit with one more attachment. When you buy this kit, the attachments that you will get are the multipurpose cutting guide, a sanding/grinding guide, circle/straight edge guide and detailer's grip. This kit can do everything the two above can do as it has almost all accessories you get on both and with an extra attachment to make it a little more versatile. Dremel 4000-6/50 is the most comprehensive rotary tool kit in the 4000 series, and it has more attachments and accessories than all the other three options. And what this means that it can do everything they can do and much more. Its 6 attachments are a flex shaft attachment, multipurpose cutting guide, sanding/grinding attachment, cutter/straight edge guide, lawn mower and garden tools sharpening attachment and a shield attachment. 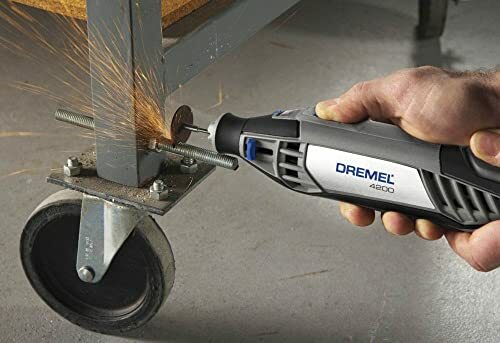 With more attachments and accessories than any other Dremel 4000 kit, this is a great choice for those that use rotary tools a lot and for different purposes. Dremel 4200-4/36 is the most affordable of the three model 4200 kits and it would be a great buy for someone looking for something with just the basic accessories and is shopping on a budget. It has 4 attachments and 36 accessories which is still quite high as it is more than what you get on all Dremel 4000 kit options except one. The 4 attachments are a lawn mower and garden tool sharpener, sanding/grinding guide, multipurpose cutting kit and shield rotary attachment. With a couple of extra attachments and 4 more accessories, the Dremel 4200-6/40 is more versatile than the 4/36 but still not as versatile as Dremel 4200-8/64. But, this 47-piece rotary tool has more than enough attachments and accessories for most DIYers and craftsmen. Its attachments are the lawn mower and garden tool sharpener, circle cutter and straight edge guide, multipurpose cutting kit, shield rotary attachment, sanding/grinding guide and detailer’s grip attachment. For accessories, you get the following. Dremel 4200-8-64 comes with 8 attachments and 64 accessories which is more than what you get not only on most Dremel rotary tool kits but also on those from most other top brands. And so whether you need something for polishing and cleaning as you finish your projects or for cutting and grinding this will be a great buy. The 8 attachments are a flex shaft attachment, shield attachment, detailer’s grip attachment, circle cutter/ straight edge guide attachment, right angle attachment, sanding/grinding guide attachment, garden tool sharpener attachment and a cutting guide attachment. There are plenty of accessories and attachment on this kit to help with various home improvement, DIY, and crafts. And it will also come with a deluxe storage case for easy organization and storage of the tool and all accessories/attachments. When it comes to choosing between the Dremel 4000 and Dremel 4200, your choice will ultimately depend on your preferences and budget because the two are quite similar. Both have the same motor size and power and same speed. And both also use the more comfortable 360-degree grip and are compatible with all Dremel accessories and attachments. However, Dremel 4200 seems to have a slight edge when it comes to the accessory change system because the EZ Change will allow for wrench-free accessory changes. Also, it is a more compact and lightweight rotary tool that comes with a relatively longer electrical cord. The bottom line is that the Dremel 4200 is a slightly better tool than the 4000 and this is more so if you go for the 4200-8/64 kit option. But if you are shopping on a tight budget, the more affordable Dremel 4000 is a great buy because their 4000-6/50 kit can offer almost the same versatility that you get from the 4200. And it is also possible to get a keyless chuck for the 4000 to make accessory changes easier.